I love to cook on weekends...a big breakfast and big dinner; however there are the days I lose steam after cooking a big breakfast and want something easy for dinner. Answer...slow cooker! I love the ease of throwing a bunch of ingredients into the slow cooker and then waiting for the delectable smells to permeate my house or better yet leave to run errands and come home...knowing a warm delicious meal is awaiting me. 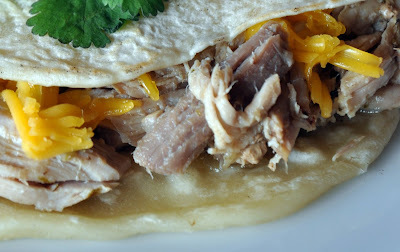 Make sure you check out the recipe for Homemade Flour Tortillas to make your tacos. Add onion, Worcestershire sauce, lime juice, garlic, cilantro and green chiles to the slow cooker. Mix all of the seasonings in a bowl and rub half of the seasonings onto the roast. Add the rest of the seasonings to the onion mixture in the slow cooker. Center the roast, fat side up on top of the onion mixture. Cover and slow cook on high for 4 to 6 hours or until tender and easily falls apart with a fork. 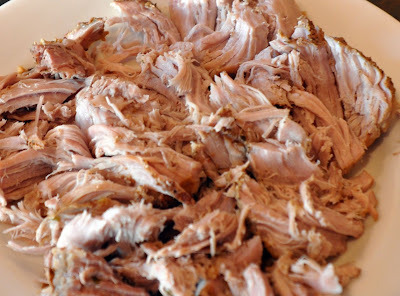 Before serving, remove as much fat as possible from the pork then shred with two forks. Make or warm the tortillas. Top tortillas with pork and cheese. Serve with lime wedge to be squeezed over the taco. That's a great breakfast!!!! I like your tortillas! I have made these twice since you posted the recipe. They are wonderful. I used your homemade tortilla recipe also and my family loved them. They would be great for a small, informal dinner get together. Loved them! Thanks Rose! I am so glad that you like them!